If I told you that General Motors was selling a wagon that barely had space for five people and not much room for their luggage, a wagon that got 25 miles per gallon on the highway sucking premium unleaded gasoline and that had a base price of nearly $35,000, most of you would laugh, or shake your heads in pity and start counting the days until GM went out of business. But there is such a wagon, actually a little hatchback, the Audi A3 3.2 Quattro, one of two A3 models introduced in the United States in 2005. No one is laughing at the little runner. The 3.2 Quattro and its companion A3 2.0T have been selling well -- up 49.2 percent from 5,389 sold in the United States in 2005 to 8,040 sold last year. A3 sales remain strong in 2007, with the most expensive model, the 3.2 Quattro driven for this column, dominating consumer attention. How is that possible? How can a company offer a vehicle that, in terms of utility and overall value, easily is outclassed by others in its price category and still be successful? It's simple. It's cachet. German automobile manufacturer Audi has it. GM, in the thinking of many consumers in the American marketplace, doesn't. Cachet sells. It generates profits through the exploitation of perceived value, as opposed to pulling dollars from the actual worth of a thing itself. In the 10 years between its birth in Europe and its arrival on U.S. shores, the A3 changed from an economy car to an "entry-level luxury" automobile -- in keeping with Audi's long-range goal to firmly establish itself in the American psyche as a manufacturer of premium cars. For 2008, the A3 remains pretty much as it was in its U.S. debut, with the exception of changes to accommodate iPods, MP3 players and other infotainment electronics consumers now want in their personal vehicles. The base A3 2.0T is the closest you can get to a stripper car and still be in an Audi in the U.S. market. It has a standard, six-speed manual transmission; a turbocharged, two-liter, 207-horsepower, four-cylinder engine; a need for premium unleaded gasoline; and a federal fuel-economy rating of 21 miles per gallon in the city and 29 mpg on the highway. The tested 3.2 Quattro has more oomph with a 3.2-liter, 250-horsepower V-6. It gets 18 miles per gallon in the city and 25 miles per gallon on the highway and comes with that nearly $35,000 price tag. For similar money, a price range of $26,000 to $35,000, a consumer could buy a much larger, much more utilitarian, front-wheel-drive Chevrolet Impala sedan with a 3.9-liter, 233-horsepower V-6 engine that gets 18 miles per gallon in the city and 28 miles per gallon on the highway -- using less-expensive regular unleaded gasoline. Granted, this is an apples-and-oranges comparison. The 3.2 Quattro is a compact hatchback and the Impala is a mid-size sedan -- and they are worlds apart from each other in consumer perception. But my point is that the Impala does a substantially better job than the A3 wagons in doing what cars and wagons basically are designed to do: move people and their stuff. Even if you did a more logical comparison -- small all-wheel-drive wagon versus small all-wheel-drive wagon -- you'd have to scratch your head pondering the cost of the tested 3.2 Quattro versus that of, say, the much more accommodating but equally powerful Subaru Legacy 2.5 GT Limited that sells at a base price nearly $2,000 less. But, again, perception rules the auto retail business. In that world, comparing an Audi with a Subaru makes about as much sense as comparing a diamond bought from Jared with one purchased from Wal-Mart. Both glisten. But only one has cachet. That one, here, is the 3.2 Quattro. It does not carry five people as comfortably as transporting them in a Chevrolet Impala sedan or a Subaru Legacy wagon. It does not offer more safety, reliability or fuel economy. It runs faster and handles better than many vehicles in the same price category. It is more fun to drive. It definitely has pizazz. But there is only so much I'm willing to pay for fun and prestige, especially at the expense of almost everything else. The 3.2 Quattro pushes the limit. Complaints: The Audi A3 3.2 Quattro wagon costs too much. It runs the risk of crashing into common sense and injuring the one major thing it has going for it -- cache. It validates reverse snobbery. Drive, acceleration and handling: All are excellent. No complaints here. But if you want a small sports sedan or coupe, you should buy one of those instead of buying what is supposed to be a wagon. Head-turning quotient: Chic, expensive and priced to stay that way. Body style/layout: The Audi A3 is a compact, "entry-level-luxury," front-engine, four-door wagon with a rear hatch. It is available with front-wheel-drive or all-wheel-drive and is offered in two basic trim levels -- 2.0T and 3.2 Quattro. Engine/transmission: The 3.2 Quattro comes with a 3.2-liter, 24-valve V-6 that develops 250 horsepower at 6,300 revolutions per minute and 236 pound-feet of torque at 2,800 revolutions per minute. It is mated to a six-speed automatic transmission that can be shifted manually. Capacities: There is seating for five people. But rear-seat space is cramped. Maximum luggage capacity is 19.5 cubic feet with the 60/40-split rear seats folded down. But it diminishes greatly with rear seats up. The fuel tank holds 14.5 gallons of required premium unleaded. Mileage: Real-world mileage was not impressive for a compact wagon. I and my associate, Ria Manglapus, had a combined city-highway mileage of 20 miles per gallon. Safety: Side and head air bags, electronic stability and traction control are standard. 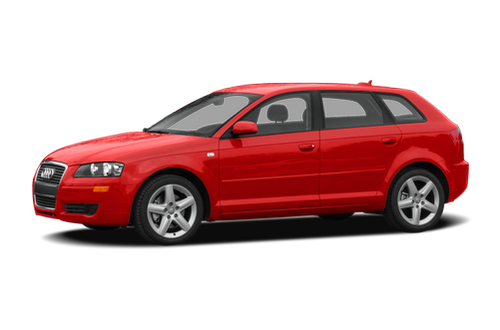 Price: Base price on the 2008 Audi A3 3.2 Quattro is $34,915. Dealer's invoice price on the base model is $32,412. Price as tested is $41,225, including $5,535 in options (navigation system with iPod interface, sunroof, heated leather seats, Bluetooth phone interface) and a $775 destination charge. Dealer's price as tested is $38,225. Prices sourced from Audi and www.edmunds.com.